For other people named Michael Shannon, see Michael Shannon (disambiguation). Shannon made his film debut in 1993 with Groundhog Day and received widespread attention for his performance in 8 Mile (2002). He is known for his on-screen versatility, performing in both comedies and dramas. His projects include Pearl Harbor (2001), Bad Boys II (2003), Bug (2006), Before the Devil Knows You're Dead (2007), Bad Lieutenant: Port of Call New Orleans (2007), The Iceman (2012), Man of Steel (2013), and The Shape of Water (2017). Shannon is a frequent collaborator of Jeff Nichols, appearing in all of his films: Shotgun Stories (2007), Take Shelter (2011), Mud (2012), Midnight Special, and Loving (both 2016). He is also known for his role as Nelson Van Alden in the HBO period drama series Boardwalk Empire (2010–2014), for which he was nominated for three Screen Actors Guild Awards. Shannon was born in Lexington, Kentucky, and is a grandson of entomologist Raymond Corbett Shannon. His father, Donald Sutherlin Shannon, was an accounting professor at DePaul University, and his mother, Geraldine Hine, is a lawyer. He was raised by his divorced parents in both Lexington, Kentucky, and Chicago, Illinois. Shannon's first film role was as the main character in the music video for the Every Mother's Nightmare song "House of Pain", in which he played a troubled teenager who was running away from his abusive lifestyle. He later became a stage actor in Chicago. He helped found A Red Orchid Theatre, where he still regularly performs. He has since worked with the Steppenwolf Theatre Company, Northlight Theatre, and other acting companies. Shannon originated the role of Peter Evans in Bug in 1996 and also starred in the 2006 film adaptation with Ashley Judd and Harry Connick Jr., directed by William Friedkin. His roles in Bug and Killer Joe were written by Steppenwolf ensemble member Tracy Letts. Shannon made his film debut with a small role in Groundhog Day in 1993 as a wedding groom. Later, he had roles in Jesus' Son, Pearl Harbor, 8 Mile and Vanilla Sky. He played the villain in Kangaroo Jack. After a role in Bad Boys II, he had a major role in Grand Theft Parsons as the hippie, Larry Oster-Berg. In 2006, he played the leader of a prison white supremacist group, Lynard, in Let's Go to Prison. Shannon has appeared in several shows in the West End in London, including a production of Woyzeck directed by Sarah Kane. In 2008, Shannon was featured in the off-Broadway production of Stephen Adly Guirgis's The Little Flower of East Orange, presented by LAByrinth Theater Company and The Public Theater, directed by Philip Seymour Hoffman and also featuring Ellen Burstyn. In 2008, he starred in the romantic drama film Revolutionary Road, alongside Leonardo DiCaprio and Kate Winslet. His performance as the clinically insane son earned him universal acclaim, and won the Satellite Award for Best Supporting Actor – Motion Picture and received an Academy Award nomination for Best Supporting Actor. In 2010, he portrayed Doc Cross Williams in the film adaptation of Jonah Hex. Shannon played Federal Prohibition agent Nelson Van Alden in the HBO television show Boardwalk Empire, which began in 2010. In November of that year, he began starring in the one man play Mistakes Were Made at the Barrow Street Theatre in New York City, with performances having run through February 27, 2012. Shannon had previously performed the show in 2009 at A Red Orchid Theatre in Chicago. In 2011, Shannon starred in the drama film Take Shelter. He received rave reviews for his performance, and a Saturn Award for Best Actor. In 2012, he played a corrupt cop in the film Premium Rush, written and directed by David Koepp, and appeared on Broadway in Grace along with Paul Rudd and Ed Asner. In 2013, he starred as legendary mob hitman Richard Kuklinski in The Iceman, which was distributed in May 2013. His performance received much acclaim from critics. Also that year, Shannon portrayed General Zod, the main antagonist in Zack Snyder's film Man of Steel. Shannon portrayed music icon Elvis Presley alongside Kevin Spacey as President Richard Nixon in Elvis & Nixon. In 2015, he was seen in the biographical drama film Freeheld, as well as the independent drama film 99 Homes as housing agent Rick Carver, a role that earned him widespread critical acclaim, and nominations for the Golden Globe Award for Best Supporting Actor – Motion Picture and the Screen Actors Guild Award for Outstanding Performance by a Male Actor in a Supporting Role.2015 was also the release year for The Night Before where Shannon played Mr. Green alongside Seth Rogen, Anthony Mackie, and Joseph Gordon-Levitt. The following year, he starred in the psychological thriller film Nocturnal Animals, alongside Amy Adams and Jake Gyllenhaal. His performance as a detective investigating the violent incident garnered him critical acclaim, and was nominated for his second Academy Award for Best Supporting Actor. He played Col. Richard Strickland in Guillermo del Toro's romantic fantasy film The Shape of Water. The film had its world premiere at the 74th Venice International Film Festival, where it won the Golden Lion. In 2018, he played the lead role as Gary Noesner in Waco on Paramount Network. In 2002, Shannon formed the indie rock band Corporal, along with Ray Rizzo and Rob Beitzel. Shannon sings and writes lyrics for the band. In 2010, Corporal released their self-titled debut album. Following the album's release two MP3 tracks have been released for download. The first track "Glory" was released in 2011 and the second song titled "Obama" was released in June 2012 as the band's way of endorsing President Obama's run for reelection. Shannon is in a relationship with actress Kate Arrington; they have two daughters, Sylvie and Marion. They live in the neighborhood of Red Hook located in the New York City borough of Brooklyn. 2008 Revolutionary Road John Givings, Jr.
1999 Turks Man #1 Episode: "Pilot"
2005 Law & Order: Special Victims Unit Avery Shaw Episode: "Quarry"
2009 Delocated Mark Episode: "Sick of It!" 2016 Lip Sync Battle Himself Episode: "Michael Shannon vs. Rachel Bloom"
2017 At Home with Amy Sedaris Julien Penderel Episode: "Murdercide"
Room 104 Nathan Episode: "Swipe Right"
^ "Kentucky Births, 1911–1999". (subscription required) Archived September 6, 2012, at the Wayback Machine Kentucky Department for Libraries and Archives. Frankfort, KY.
^ Tapley, Kristopher (December 24, 2008). "Interview:Michael Shannon". InContention.com. Archived from the original on July 26, 2011. Retrieved May 24, 2011. ^ a b "Obituary & Guest Book Preview for Dr. Donald S. Shannon". Chicago Sun-Times. ^ Dr. Donald S. Shannon Archived June 17, 2016, at the Wayback Machine. Chicago Tribune. November 24, 2008. ^ Who's Who in the Midwest, 1982–1983 – Marquis Who's Who, LLC – Google Books. Books.google.ca. July 1982. ISBN 9780837907185. Retrieved June 26, 2013. ^ "unknown title". Chicago Tribune. Archived from the original on January 2, 2013. ^ a b Edelstein, David (December 28, 2008). "Killer Instincts". New York. Archived from the original on January 11, 2009. Retrieved January 22, 2009. ^ Phillips, Michael (January 22, 2009). "Early thoughts on the Oscar horse race". Chicago Tribune. Archived from the original on January 24, 2009. Retrieved January 23, 2009. ^ Wood, Mark Dundas (May 23, 2007). "Catching the 'Bug'". Backstage. Archived from the original on June 30, 2012. ^ Cole, David (April 7, 2008). "The Little Flower of East Orange – Theater". Time Out New York. Archived from the original on June 16, 2008. Retrieved January 23, 2009. ^ "Revolutionary Road". Rolling Stone. Archived from the original on March 30, 2018. Retrieved March 29, 2018. ^ "Revolutionary Road". Variety. Archived from the original on March 30, 2018. Retrieved March 29, 2018. ^ "'Revolutionary Road' stars Kate Winslet, Leonardo DiCaprio, Michael Shannon". Chicago Tribune. Archived from the original on March 30, 2018. Retrieved March 29, 2018. ^ "Oscar Watch: Revolutionary Road Review". Archived from the original on March 30, 2018. Retrieved March 29, 2018. ^ "Golden Satellite Award Winners". Awards Daily. Archived from the original on April 16, 2018. Retrieved April 15, 2018. ^ Hoard, Catherine (January 22, 2009). "Oscar nominations: How Michael Shannon stole Kate Winslet's glory". The Guardian (UK). London. Archived from the original on July 9, 2017. Retrieved December 12, 2016. ^ "Mistakes Were Made". Stage Grade. Archived from the original on April 23, 2012. ^ Del Signore, John (December 2, 2010). 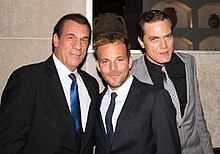 "Actor Michael Shannon, Mistakes Were Made". Gothamist. Archived from the original on December 3, 2010. ^ "Take Shelter". Chicago Sun-Times. Archived from the original on June 18, 2012. Retrieved November 16, 2018. ^ "RISE OF THE PLANET OF THE APES and SUPER 8 lead Saturn Awards with 3 awards each". saturnawards.org. July 26, 2012. Archived from the original on June 27, 2015. Retrieved July 27, 2012. ^ Kit, Borys (June 20, 2010). "Two joining Joseph Gordon-Levitt thriller". The Hollywood Reporter. e5 Global Media. Archived from the original on June 25, 2010. Retrieved August 8, 2010. ^ Kilday, Gregg (April 10, 2011). "Michael Shannon Set to Play Villain General Zod in 'Man of Steel'". The Hollywood Reporter. Archived from the original on April 12, 2011. Retrieved April 11, 2011. ^ "'Elvis & Nixon' Trailer Has Michael Shannon and Kevin Spacey Hiding Guns and Slapping Knuckles". Collider. Archived from the original on December 10, 2017. Retrieved December 9, 2017. ^ "Golden Globes Winners: The Complete List". Variety. Archived from the original on August 2, 2017. Retrieved July 23, 2017. ^ "SAG Awards Winners 2016: Complete List". Vanity Fair. Archived from the original on June 2, 2016. Retrieved July 23, 2017. ^ "Nocturnal Animals review: Tom Ford returns with a superb, painstakingly crafted movie sure to pick up awards". The Independent. Archived from the original on November 21, 2016. Retrieved March 21, 2017. ^ "'Nocturnal Animals' Review: Tom Ford's Complex Suspense Thriller Is Worthy Of Hitchcock". Deadline Hollywood. Archived from the original on February 21, 2017. Retrieved March 21, 2017. ^ "Review: Tom Ford's 'Nocturnal Animals' has a wild style". USA Today. Archived from the original on August 18, 2017. Retrieved July 9, 2017. ^ "'Nocturnal Animals' Review: Stories of Your Life". Collider. Archived from the original on August 18, 2017. Retrieved August 17, 2017. ^ "Michael Shannon connected to his 'Nocturnal Animals' lawman character from the get-go". Los Angeles Times. Archived from the original on March 6, 2017. Retrieved March 5, 2017. ^ "Michael Shannon in Talks to Star in Guillermo del Toro's Cold War Love Story (Exclusive)". The Wrap. Archived from the original on August 31, 2017. Retrieved July 27, 2017. ^ "Venice Film Festival Sets Lido Launch for Aronofsky, Clooney, Del Toro, Payne & More As Awards Buzz Begins – Full List". Deadline Hollywood. Archived from the original on October 16, 2017. Retrieved October 24, 2017. ^ "Guillermo de Toro's The Shape of Water wins Venice Golden Lion". The Guardian. Archived from the original on December 20, 2017. Retrieved October 24, 2017. ^ "Guillermo del Toro's 'Shape of Water' Gets Awards-Season Release Date". Variety. Archived from the original on April 20, 2017. Retrieved July 27, 2017. ^ Eakin, Marah. "Corporal, Michael Shannon's non-terrifying band, premières new track". A.V. Club Chicago. Archived from the original on June 27, 2012. Retrieved June 20, 2012. ^ Pearis, Bill. "Michael Shannon's band Corporal endorses Obama (MP3), playing Fontana's". Brooklyn Vegan. Archived from the original on September 23, 2015. Retrieved September 2, 2015. ^ Kaufman, Joanne. "Michael Shannon Finds Balance on the Waterfront". The New York Times. Archived from the original on June 24, 2018. Retrieved March 2, 2017. ^ Kit, Borys. "Hilary Swank, Michael Shannon to Star in Drama 'What They Had' (Exclusive)". The Hollywood Reporter. Archived from the original on March 17, 2017. Retrieved March 17, 2017. Wikimedia Commons has media related to Michael Shannon.